Ages 5 through 11. 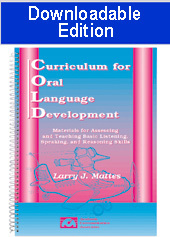 This book includes criterion-referenced assessment measures and instructional activities for teaching listening skills, thinking strategies, vocabulary, grammar, and basic pragmatic communication skills. Skills emphasized include answering questions, associating nouns with their functions, classifying nouns, expressing needs and feelings, using vocabulary effectively, describing actions, describing characteristics of objects, describing experiences, solving problems, describing a process, expressing viewpoints, sequencing stories, predicting conclusions, and other skills. Acrobat Reader, available free from www.adobe.com must be on your computer to use the digital file.